One of the greatest difficulties facing foreign ministries in the digital age is the need to react to events in real time. The need for speed, as it were, is in direct contradiction to diplomacy’s need for time to respond to events by pooling resources, gathering intelligence and formulating policy recommendations. However, this week saw the manner in which foreign ministries can use digital tools to their advantage by creating frames, or prisms, through which international events are to be understood by global audiences and new outlets. On Tuesday, the 14th of July, Iran and the world powers announced they had reached an agreement regarding Iran’s nuclear weapons program. What soon followed was a well-coordinated social media campaign in which each foreign ministry offered its framing of the agreement in terms of achievements and impact on world affairs. By focusing on the Israeli, Iranian and American social media campaigns, it may be possible to illustrate the stages through which MFAs framed the coverage and understanding of the “Iran Deal”. During this stage, foreign ministries announce on social media that an agreement had been reached giving way to a flurry of SNS activity by global audiences and news outlets that soon re-tweet the news. The following tweet by the BBC shows how the announcement spread among twitter users in Iran. By breaking the news on social media diplomatic institutions garnered global attention and laid the foundations for the second stage, press conferences. The press conferences by world leaders may be viewed as “media events”, pre-organized events that exist for the purpose of publicity. Yet in the context of social media campaigns, these press conferences begin construction of the prism through which a global occurrence is to be interpreted. It is during these conferences that the narrative of each nation begins to take shape. Such press conferences, which are rather long, may be mainly targeted at keen global netizens and traditional media outlets. This was most evident in the case of President Obama’s conference which took place at 7 a.m. Washington time. The scheduling was most likely influenced by a desire to seize control of the US news cycle and be in tune with events taking place in Europe thus also accommodating a 24 hour news cycle. In the next stage, the main elements of the press conference are converted into a long series of tweets with each tweet adding to a nation’s frame. 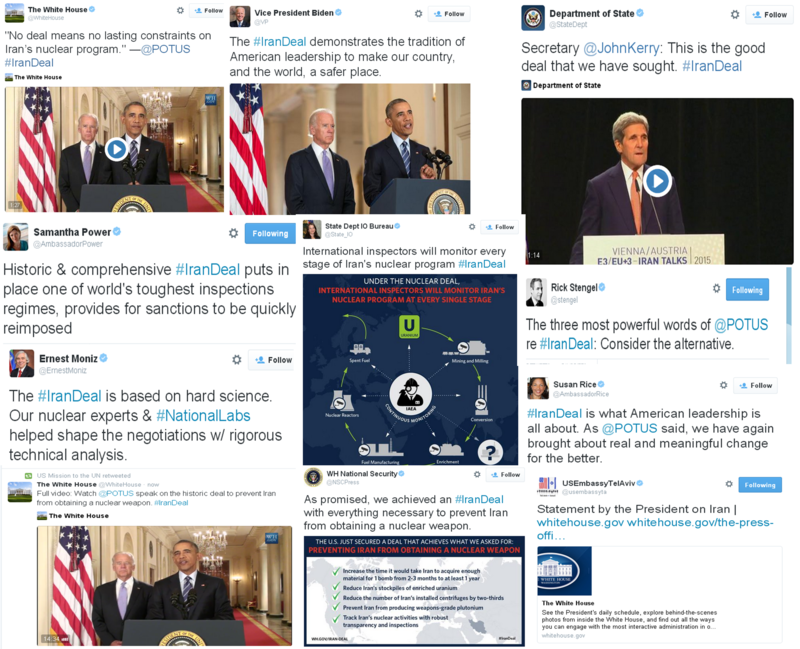 It is the extensive use of infrographics in US tweets published during Obama’s press conference which suggests that this was indeed a coordinated social media campaign. Israel- In a series of tweets posted by the Israeli PM, and re-tweeted by the MFA, Israel offered its frame of events. Interestingly, this frame did not deal with Iran’s nuclear ambition but rather with its role as a sponsor of global terror. According to this frame, Iran is the main exporter of terror in the world. The agreement reached in Vienna will enrich the country thereby adding to its global web of terror that targets America, a country that Iran still seeks to destroy. The meta frame offered by Israel is “that the world is more dangerous today that it was yesterday”. Finally, Israel offered a historic comparison between the “Iran Deal” and the North Korea nuclear agreement which ultimately failed. This framing seems to be directed entirely at American audiences and still employs a Bush-esque jargon emphasizing an axis of evil between Iran and North Korea and the specter of Muslim terror. The USA- According to the American frame, diplomacy has achieved that which war cannot, a comprehensive agreement with Iran which meets all the goals set out by the US. All avenues to an Iranian bomb have been blocked. This agreement demonstrates that engagement with Iran, and principled diploamcy, are the new hallmarks of US global leadership. Thus, the framing of the “Iran Deal” accommodates the Obama administration’s meta-frame of engagement and dialogue with the Muslim world. The historical comparison offered here is between the Iranian agreement and US-Russian nuclear negotiations that saved the world from the brink of annihilation. The US framing of the deal is therefore at odds with the Israeli one. Iran: The Iranian frame seems to complement the American one. Just as the US seeks dialogue with the Muslim world, Iran seeks dialogue with the Western world. Like the US, Iran emphasized the importance of its diploamcy and a “win-win” approach. Like the US, Iran also stated that its main goal was achieved- the lifting of economic sanctions. Iran also emphasized the fact that the agreement will only contribute to regional stability thus fitting into an Iranian meta frame of “Iran as a regional superpower”. Finally, Iran linked the agreement to the month of Ramadan thereby presenting the agreement as an achievement for all Muslims. This may also be regarded as a statement of regional stability given the conflicts between Shiite and Sunni Muslims across the Middle East. Once each side offered its frame events, the fourth stage began in which MFAs disseminated their messages across numerous platforms and social media accounts. In order to demonstrate this stage I focused solely on US social media channels. Once Obama’s press conference had ended, US officials embarked on a social media blitz. This included nearly all high ranking US officials and diplomatic institutions. 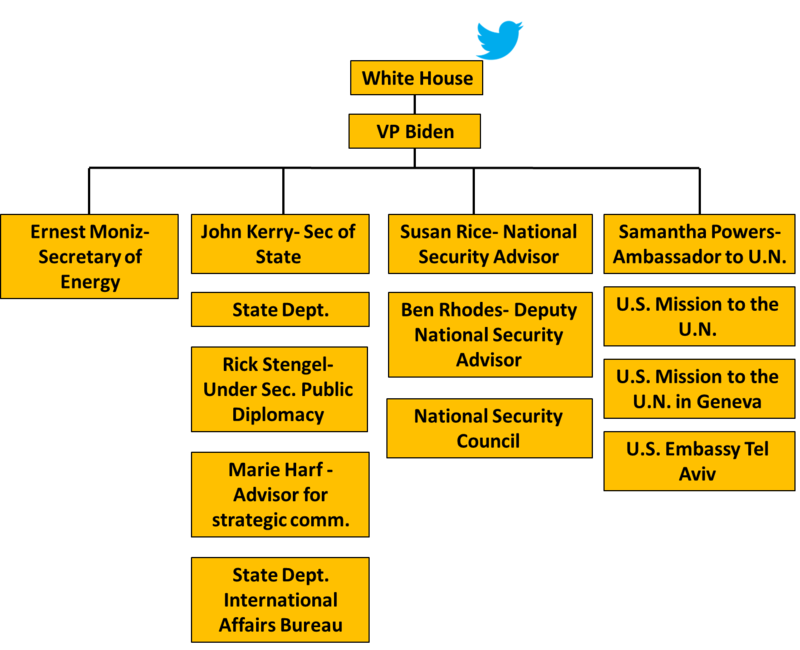 The chart below details US officials and institutions that tweeted the administration’s main messages followed by several examples. 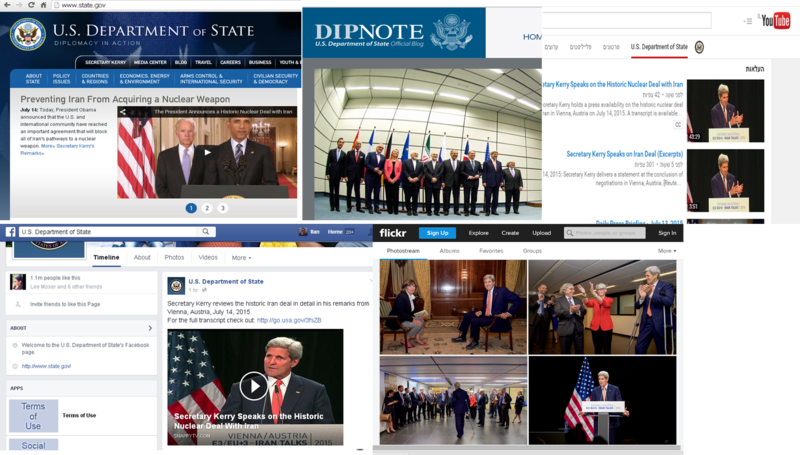 Cross Platform- The State Department also disseminated its core messages across all of its social media platforms including twitter, Flickr, Facebook, Google +, YouTube and its blog DipNote. Once all messages had been disseminated by all officials, and across all platforms, the foreign ministries moved to the final stage, publication of the Iran agreement. This is the final stage in which foreign ministries invite audiences to read the entire agreement as they have already created the prism through which followers and the media are to interpret the agreement and its implications. This publication also lends legitimacy to foreign ministries given their transparency. Question- Is This an Example of Transmedia Storytelling? In a recent scholarly article, James Pamment argues that the UK’s End Sexual Violence social media campaign was a form of transmedia storytelling. I find myself wondering if this is also the case with the various “IranDeal” social media campaigns. Analysis of US officials showed that they disseminated the overall frames laid out by Obama while adding to them. Most officials did not simply re-tweet messages but authored their own tweets. Given such authoring, and the use of cross platform dissemination (i.e., Facebook, twitter, Flickr), perhaps this is another example of what Pamment calls transmedia storytelling in digital diplomacy. Posted in Uncategorized and tagged Digital Diplomacy, Facebook, Framing, framing theory, Iran, Iran Deal, Israel, Nuclear Weapons Program, Obama, Social media, twiplomacy, Twitter, USA. Bookmark the permalink.